The standard by which all others are judged. It is simply an opinion, but one shared by the majority of tactical teams at all levels in the United States. You can sense it the first time that you fire one. The MP5 is the culmination of countless efforts to blend reliability, controllability and firepower into a small package. With the MP5, that design objective has been achieved. The MP5 is that by which all other designs are judged. Appearing in countless movies of late, it does not have the catchy name of some guns that have been demonized by the press and some politicians, who quake in fear at the mere mention of names like 'Uzi' or 'Tec 9' or 'MAC 10.' Your average street criminal might not know what to call the greatest submachine gun ever designed. Chances are, if you laid one down next to a Tec 9 and asked the criminal to choose one, he might opt for the Tec. So much for good taste. There are many photographs of the MP5. I will share some of my favorites with you here. 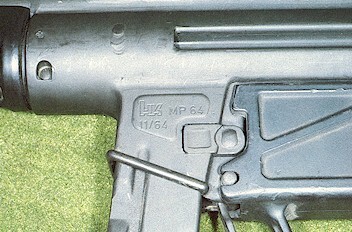 Just for the record, many published articles designate the MP5 as thus: "MP-5." Not correct. There is no hyphen. 1964: HK designer Tilo Möller, Manfred Guhring, Georg Seidl and Helmut Baureuter start design work on "Project 64" --the beginning of the MP5. 1966: The first production MP5 is officially introduced, but by mid-1966, the German Border Police adopt the MP5. 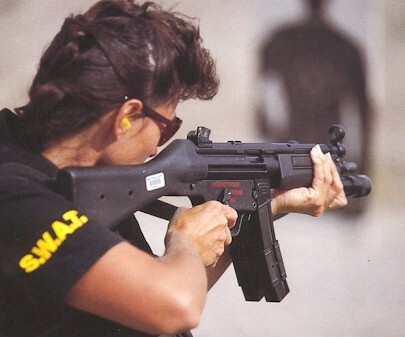 Also the first foreign sale was to the Swiss Procurement Department for Arms when the Swiss Police adopt the MP5. 1968: The first blank-firing attachments made for the MP5. Serrations removed from bolt group. Ejection port lengthened (front to back) and a piece riveted to the rear portion to lower the profile and improve case ejection. 1972: Radius changed on chamber from 2mm to 2.5 mm for improved feeding. 1973: The synthetic trigger housing was strengthened with glass fiber. The pistol grip changed from the closed, glued on end cap to the hollow open design extant even today. The scope mounting points are added to the top of the stamped steel receiver for use with the HK quick-detach scope mounting system. The R3/3 sling system is introduced. 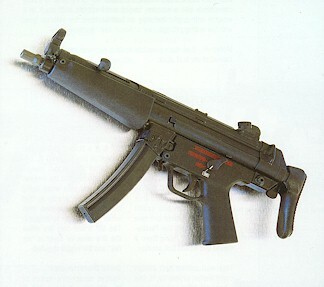 1976: The MP5K or Kurz model is developed at the request of a South American sales representative of HK. 1977: A special lacquer coating is developed for increased corrosion resistance on guns sold for export. 1978: Testing begins on the special MP5K firing briefcase. 1978: The rubber buffer is added to the retractable sliding buttstock. 1978: Extensive environmental testing iis completed on the new retractable buttstock. 1978: The tropical or "Export" forearm is tested. 1978: Testing of the new MP5 extractor spring completed. 1979: New MP5 Extractor spring introduced. For identity purposes, it is copper colored. 1980: Bushings in the rear of the MP5 receiver are strengthened by a different welding process. 1982: A new three round burst trigger group with four settings and a polymer housing is introduced. 1983: A special locked bolt version of the MP5SD is tested. 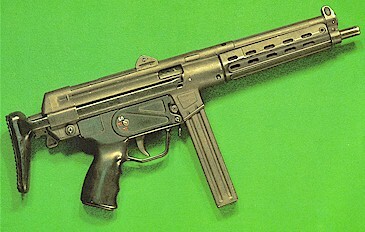 1984: The MP5PT is introduced. Designed specifically for use solely with Dynamit Nobel's plastic training ammo, it cannot fire live ammunition. 1985: Comparison testing conducted between the standard MP5SD and different versions of the SMGI, SMGII and MP2000. 1988: The "Maritim" MP5 is introduced. The Maritim is a special MP5 designed for a saltwater environment. It features special corrosion resistant coatings and finishes. 1988: Chamber flutes are installed by an EDM process, instead of broaching. Additionally, the number of chamber flutes is increased from 12 to 16. 1989: The height of the ejector is raised by .5 mm. 1989: The SP89 is introduced. 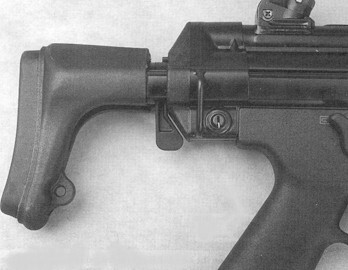 1989: Manufacture of the retractable buttstock is changed, with the buttplate being molded onto the buttstock metal. 1990: A special "SEF" trigger group is introduced that "locks out" the full auto function. Full auto fire is achieved when the right end of the safety lever is depressed, to allow the safety/selector lever to the full auto setting. 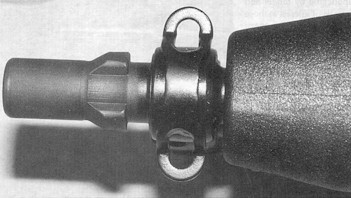 1991: Improvements made to the bolt head and chamber face. Also the contact moment was changed on the ejector in relation to the bolt group. 1991: The roller holder is changed from the flat plate to a spring or wire type holder previously seen on the HK23E. 1991: Angle on the locking piece for the MP5SD is changed from 120 degrees to 115 degrees. 1991: The PDW folding stock is developed by HK Inc. in the U.S. for personal defense and VIP protection details. When fitted to the MP5K, it allows the short MP5K to be fired from the shoulder, greatly enhancing accuracy. 1992: The MP5 in 10mm Auto and .40 S&W is introduced. 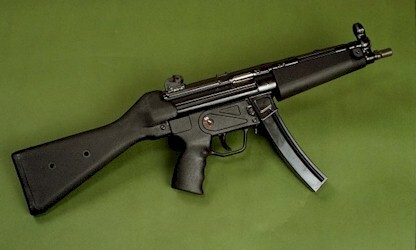 1999: The MP5F is developed and introduced. 2000: The MP5/10 and MP5/40 are discontinued. GSG-9 Operator with the ideal accessory for riding "subgun." 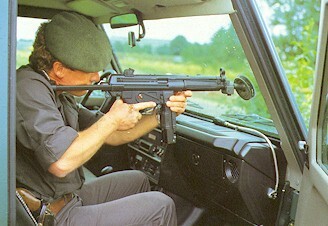 A port made for the muzzle of the MP5 to discourage car pursuits. One would think that accuracy would be much higher as such. MP5A3 with SEF trigger group, slimline forearm and early straight mags with double mag clamp. GSG-9 is the German military antiterrorist wing of the Federal German Border Guard. They were formed after the debacle of the 1972 Munich Olympics, where the German police were completely unprepared for such a contingency. In German, the Federal Border Guard is called the Bundesgrenzschutz. The special regiment of elite commandos that form GSG-9 is called Border Group-9 or Grenzschutzgruppe 9. As you might well imagine, they are a rather large customer of their home weapons factory, Heckler & Koch. Another day of Boooorrrrring training for the GSG-9. 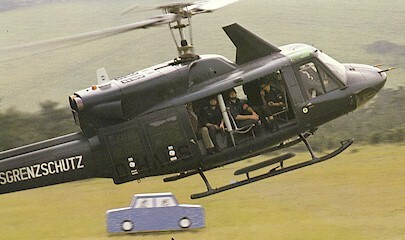 MP5A2 being fired at moving sled pulling target car from moving helicopter. Again? Do I have to? Note brass deflector. Sgt. Linda Shepard, Reno, NV SWAT takes aim with the MP5A4 and Laser Products 628 forend light. The A4 designation is for a fixed stock and three shot burst trigger group. 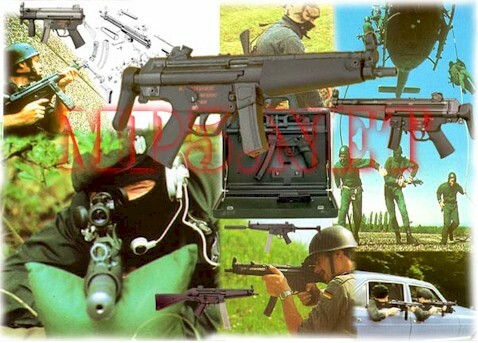 The gun on the left is an HK54, the first actual MP5 to be built under what came to be known as Project 64, named for the year the program began. 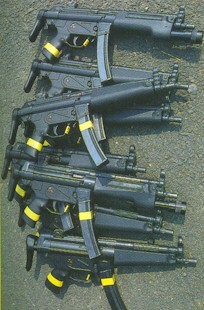 Several differences to the modern MP5 are visible. The location and type of the rear sight, the type of front sight, no lugs on the barrel, the early magazine and magazine well, the size of the ejection port. 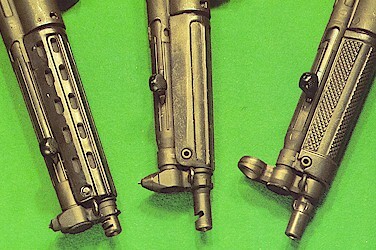 The SEF trigger group is still the most widely used on the HK series. At right is a second prototype of the MP5 called the MP64. There was no HK64 as such. This gun features an experimental pin and groove arrangement for the fastening of the trigger group to the gun. As you know, this was dropped for the pushpin arrangement that we are all familiar with. Progression of muzzles from earliest to the present. Most noticeable is the cuts in the top for recoil compensation, and the evolution of the front sight to its current hooded form and three lug barrel for the attachment of different muzzle devices. 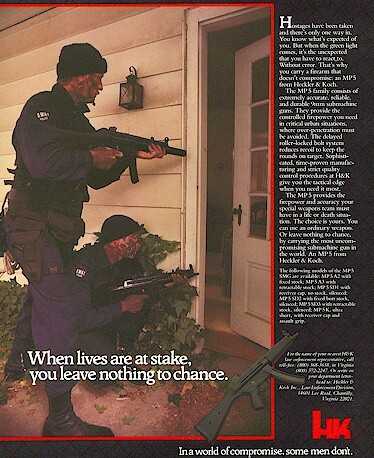 Mid-1980s ad that appeared in police trade magazines and related firearms magazines for the MP5 Submachine gun. This ad combined two of the more well known HK slogans from the 80s. Note that the fingers are on the triggers as it had not yet become common practice to train finger off trigger (Rule 3) or be photographed that way. The newest variant of the MP5 is called the MP5F. F in this case stands for 'French.' You will see why in a moment. Though hard to improve upon the basic design of the MP5, the engineers at HK strived to do so because of a potential contract for 35,000 MP5s, some to be built in France under license. The primary reason for the internal modifications that will be outlined here is the French desire to use extremely hot 9mm ammunition that is nearly proof load specification. The changes to the MP5F are subtle and not always noticeable to even the trained observer. Externally, the primary difference is in the new buttstock that has a two inch thick rubber buttpad, a sling loop on the right side of the stock for left handed shooters and a one inch increase in length of the forks. To compliment the ambidextrous sling loop on the new MP5F fork is the dual front sling bolts, a natural addition that has been mostly addressed with the ambidextrous sling and bolts long available as MP5 accessories. Internal changes to the MP5F include the following: Improvement of the locking roller holder even beyond the newer wire roller holder, to a third model that is not retrofittable to earlier existing bolt heads. The three are pictured below. From left to right: Standard holder that breaks frequently, new wire holder that seldom breaks, and the newest MP5F holder that must have special MP5F bolt head to fit. Another internal modification is to the firing pin spring, another part that was prone to breakage, albeit after several thousand rounds. The new spring is of multi-strand wire and thicker. A comparison is below, with the standard MP5 firing pin spring above it. In another move toward strengthening the MP5F for the high power French +P+ loads, the cocking handle was redesigned to help it stay forward during firing. Pictured below, the MP5F cocking lever is above, standard below. The MP5F is proof that when you thought the MP5 could not be improved upon, the engineers at HK never fail to take it one step further. This information on the MP5F came from Small Arms Review, the leading publication for the reporting on innovation and cutting edge firearms design. They can be contacted by clicking on their name above. If you have not seen SAR, you owe it to yourself to have a look. START "LOW READY" POSITION/ PASSING SCORE = 80 2 PTS PER HIT.